From ancient times our ancestors were trying to orient themselves in time to be able to determinate different seasons of the year and were trying to understand different types of natural phenomenons and decipher the mystery of their origin. How did they do that? If we think of watch nowadays we think of a digital watch or a classic analog watch. With the top quality we associate Swiss watches, with timelessness – then Michael Kors or Daniel Wellington watches are ones of many examples. But what you think of when you let your mind wander deeper into the past? Are you thinking of an antique pocket watch or maybe even an hourglass, which we know from fairy tales and stories. Is there anything else you would think of? Our ancient ancestors were trying to record the time and significant events which has already happened their own unique way and some of them they wanted to bring back. Who or what could cause a loud thunder storm or a sudden eclipse of the Sun? Maybe a wrath of Gods themselves or some almighty creatures who control time and cross dimensions? Life in caves was interwined with superstisions and succsessful hunt brought the need to cherish the memory of it, use it again and this way to be able succeed in the future as well. Cave paintings were symbols of hunters´ strenght and tribute to killed creatures. In those ancient cultures people were even trying to keep a calendar. There are not that many proofs of this - evidence is a few old Gallic calendars and even older one from megalithic times found in Irish Knowth. There is clear evidence that people were navigated by a lunar cycles, Sun movements and it is presumed that even a prehistoric calendar was following Sun and Moon cycles. Since antiquity times there have been a lot of ways in which people measured the time. Sundial or water clock were some of them. In Acient Egypt people measured the time thanks to a shadow and theirs Sundial doesn´t resemble anything we know today. As it is obvious from its name sundial is depending on Sun movements. It is usually marked with Roman Numerals and they are considered to be the oldest (to be more precise the oldest discovered) type of clock. It could be a few thousands years old. As a first sundial indicator was probably used a wooden stick sticking squarely from the ground and the shadow from it showed the flow of the time. Sundials in Ancient Egypt looked like tall and majestic obelisks. They served two purposes: as a tribute to Egyptian God Re (or also Ra) and at the same time they should show the time. In which way Egyptians read the exact time from them is still unclear. The most probably they weren´t using a watch dial with index as Greeks as there is a lot of theories in contrary with this. Index on a watch dial came much later - findings are from 15th century BC. Greeks took the discovery of sundial over from Babylonians and evolved their discovery even further (thanks to their advanced mathematical knowledge). This technology had gradually improved. Sundial could show not only the time, but also it could work as a calendar. 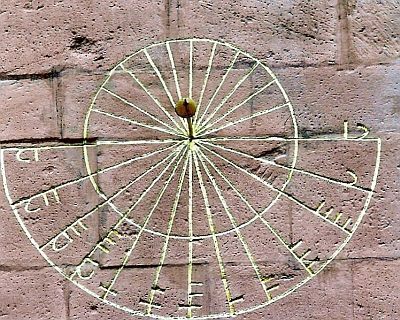 Even ancient Romans decided to use a sundial based on Greek constructional principals. The biggest sundial of the ancient world came into existance approximately at year 10 BC. It was built in Rome and it was dominated by a massive 30 metres tall obelisk. Sundials differed in various cultures. In Greek culture a day was divided into 12 equal parts. However, the time varied according seasons. Because they were using so-called nodus and exact lines what happened was that for example in winter an hour was much shorter. And for instance Vikings diveded a day only into 4 parts. The accuracy of sundials was not perfect. Original concept of this indicator was to give exact information only about spring and autumn equinox. And another disadvantage was that they couldn´t show the time at night. For these and many other reasons other types of clock were invented, which used different principle. In Islamic countries was developed in 14th century more accurate way, which was given by different direction of the gnomon. It wasn´t placed squarely to the earth surface, but it was directed according the Earth rotation axis, pointed to the North Star. This method was gradually transfer to the European countries as well. 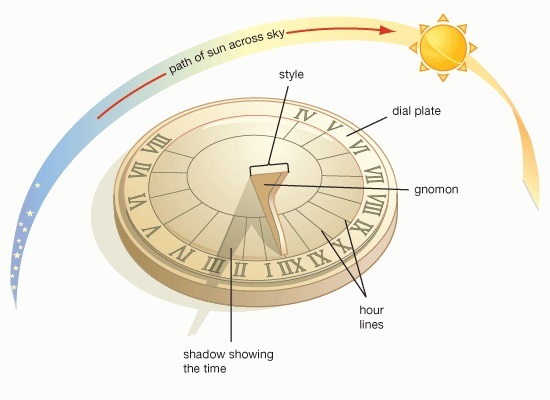 There is a few different types of sundials and their composition varies. Some of them works on the princip of hour angle (for example polar or equatorial), we can also have a moon marks ones. There is also a portable type - it is oriented by sunlight or the meridian. Although sundial oriented by the meridian has to be adjust to the specific latitude. 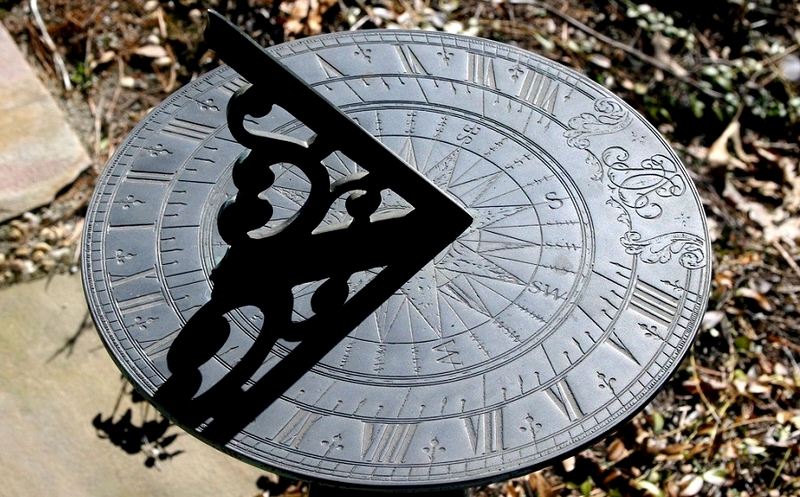 Sundials were commonly used even in 17th century and later. But with gradual development of industry and new advanced technologies they were loosing their attractiveness. The biggest blow was the introduction of zone time at the Conference in Washington in the 19th century, after that they have completely lost their practical meaning. From then they became only a lovely decoration element and their practical use perished completely. If you enjoy decorations like this, you find sundials fascinating and you wish to place them on a facade of your house you might be glad to hear that it is possible. Just be aware of the fact that the time pass differently in nature then to us. Difference between the apparent solar time and the mean solar time is determinated by the equation of time. Instructions how to make a sundial you find on the internet very easily. Are you afraid of similar experiment? You could have your sundial custom made. Or, even better, you could buy a regular fashion watch with a number of useful features. Nodus – a mark on a pointer, usually in a shape of a ball and its shadow shows the time data (or calendar). Gnomon – this word comes from Greek and means "knowledge". 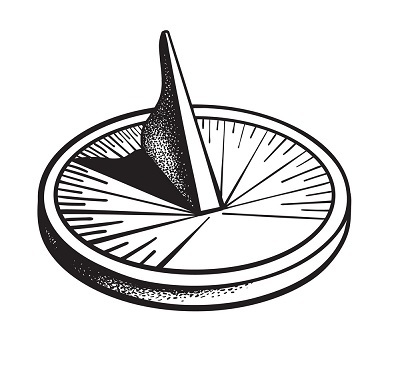 It is a sundial pointer, which is perpendicular to the dial (used by ancient Greeks and Egyptians). Mean solar time – it is our regular time. It derives from the local meridian. Each meridian has its own local time. It was created artifically to eminate differences caused by uneven motion of the Sun accros the Earth. The apparent solar time – it is measured by solar day. Solar time is a calculation of the passage of time based on the position of the Sun in the sky. Central European Time – Time zone in the Central Europe. In spring most of the countries transfers to Central European Summer Time.